Positioning your brand at a business exhibition or trade show can be a daunting task. At an event the size of the London Business Show 2016 which attracts over 10,000 attendees annually, there is increasingly more competition for businesses to cut through the noise in order to successfully reach their intended target market. At Europe’s ‘most dynamic business event’, attendees have the opportunity to network, explore the latest products & services, and hear talks from influential business speakers such as Adam Klien (UniLad), Anthony Fletcher (Graze) & Brad Burton(4N). Nevertheless, this was made ever more challenging by the wide variety of high quality showcases, exhibition stands & keynote speakers which created a highly competitive ‘landgrab’ for the precious, yet fleeting attention of event attendees. 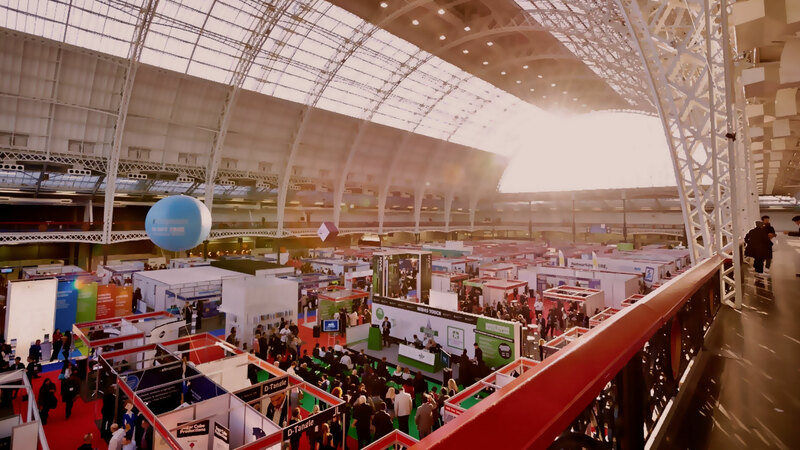 In this post, we take a look at 5 businesses that used effective marketing to really stand out at the London Business Show 2016 and give our view on what we learnt from them. UK Startup LOVESPACE is more than just a storage company. They aim create business partnerships and offer full & alternative storage solutions. Founded by the team behind ‘Streetcar’, LOVESPACE turned heads and caught major attention with the visceral style of their exhibition display stand. Equipped with a fully functioning miniature football table crafted entirely from cardboard, as well as a cardboard box mascot titled ‘Box Man’, LOVESPACE’s active sales staff drew in potential clients by challenging passers by to an impromptu match. During my game with a member of the LOVESPACE team & they spoke to me a little bit about their business. 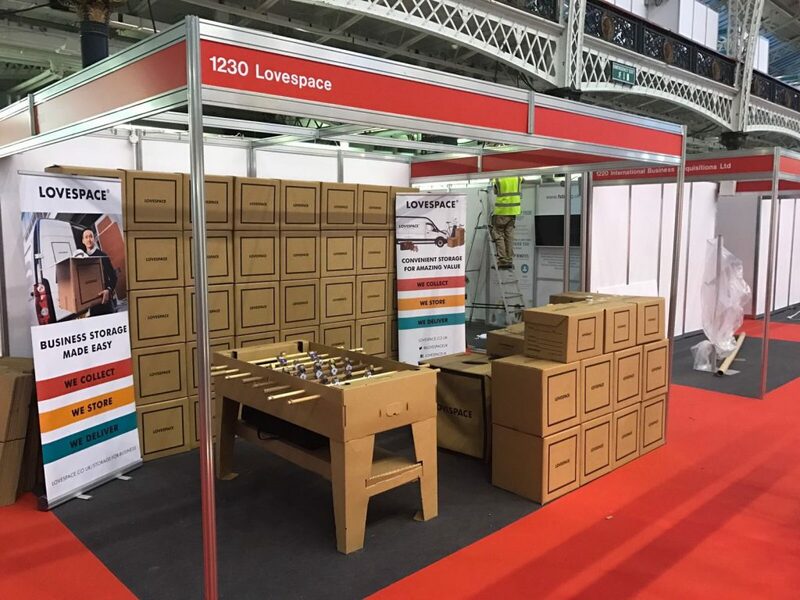 As I learnt a bit more, I realised that I was drawn into visiting the LOVESPACE stand due to their playful brand image, despite the fact that I’m not really in the market right now for their storage services. Nevertheless, although some visitors such as myself may have been considered ‘unqualified traffic’, the interaction with attendees still contributed effectively to brand awareness and over the course of the event, LOVESPACE’s novelty display generated considerable buzz on social media. Successfully demonstrating a low-cost guerrilla strategy, LOVESPACE benefited from the social sharing and engagement of event attendees. Hubble is an online marketplace that deals in office space & co-working environments aimed at startups and small-to-medium sized businesses. Hubble empowers entrepreneurs by providing work environments called ‘Hubbles’. 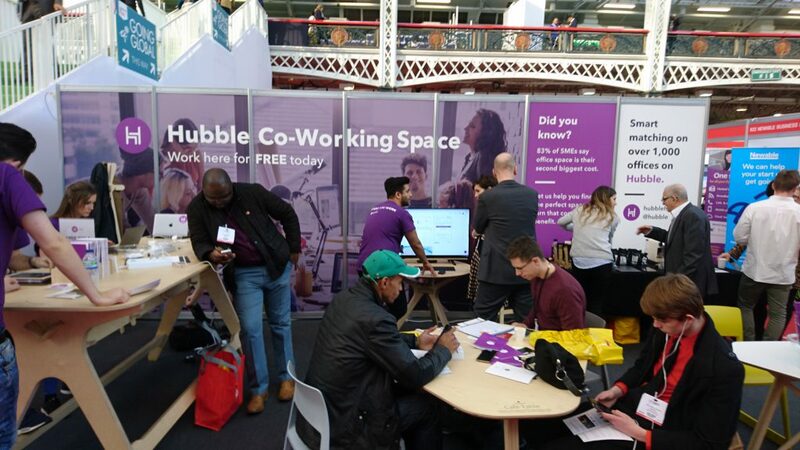 To showcase their services, Hubble set-up a dedicated pop-up co-working space and invited event attendees to ‘come down, do some work & get a free massage’. Hubble also provided free Wifi as well as mobile phone & laptop charging. On social media, Hubble provided coverage of the event before, during & after. This managed to disrupt attendees on Twitter by using the conference’s hashtag (#TBS2016) to entice people to visit the co-working space and learn more about Hubble. Furthermore, Hubble also went on to further capitalise on their attendance at the event by utilising the opportunity to produce interesting content on the topic of popup workspaces for their blog & social media channels. 9Spokes are a software company that provide dashboard software to small businesses using cloud technology. Despite being among the smaller stands on display, 9Spokes didn’t let the fact that they were a smaller company deter them. 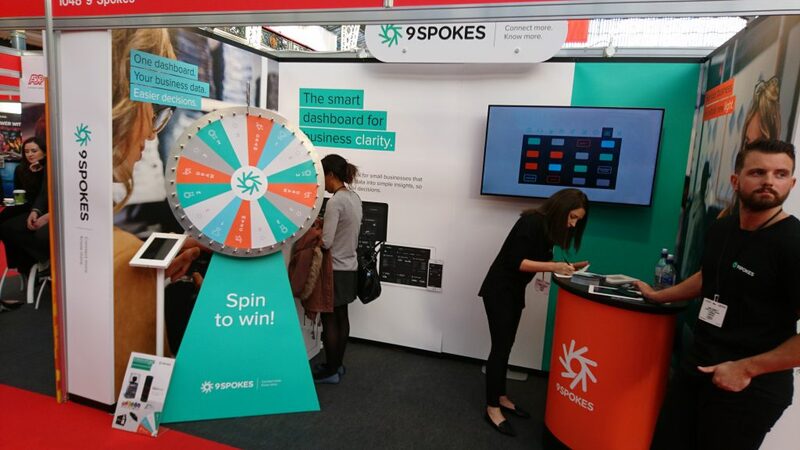 9Spokes created a clever way to draw in prospects, collect leads & farm customer data by encouraging their audience to enter a competition. 9Spokes drove competition entry by getting people to first provide their information and then they are given a chance to win a prize by spinning a giant wheel. The interactivity of the competition managed to successfully attract attendees to the stall which made a good data collection tool for 9Spokes. The competition results were later announced on social media using the event hashtag, which gave an extra boost to 9Spokes presence at the event. 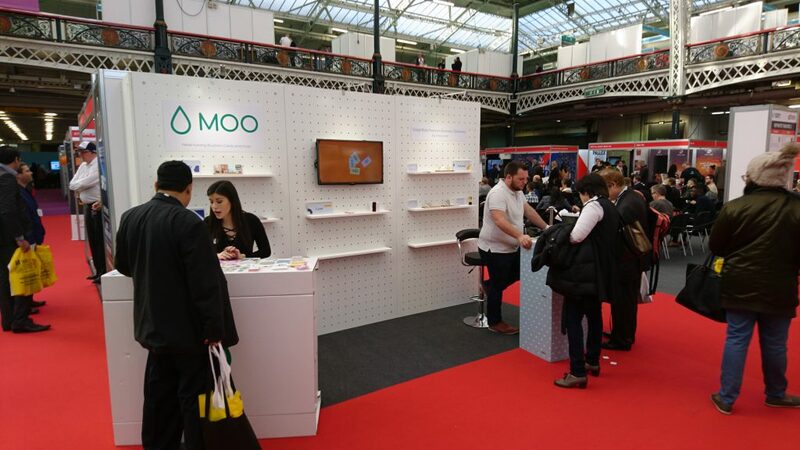 Digital Printing company Moo place creativity at the heart of their brand and at the London Business Show 2016, Moo stayed true to their core ethos with a creative stand which showcased a vast range of colourful print examples. 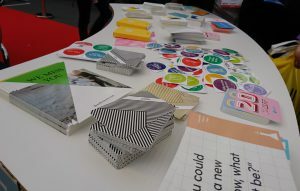 At the event, the Moo team were on hand to answer questions, provide quotations, distribute sample packs, free stickers and creative print examples to inspire people’s next print project. To sweeten the deal, exclusive discount codes were provided to those who came and interacted with their stall. Despite their overall friendly demeanour, one criticism of Moo’s presence at the exhibition is that they missed the opportunity to broadcast their attendance at the event on social media and hardly provided any event coverage which could have resulted in more reach. 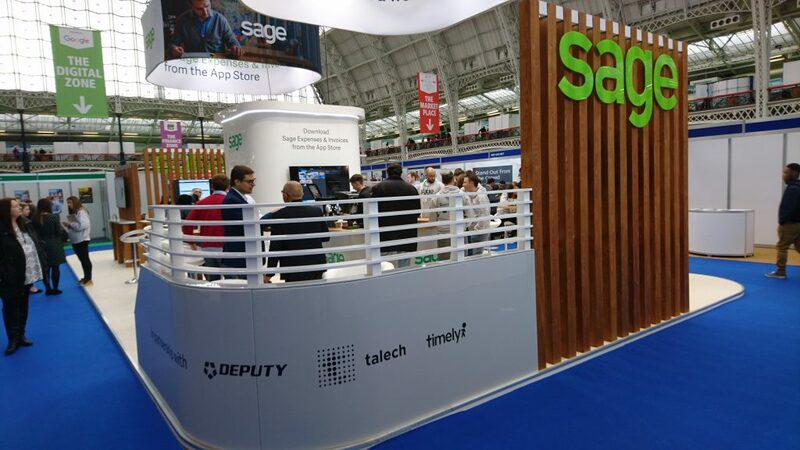 Sage (SagePay) are a leading provider in accounting, payroll & payment software for businesses and at the London Business Show 2016, Sage had a huge presence and engaged the audience in multiple ways. 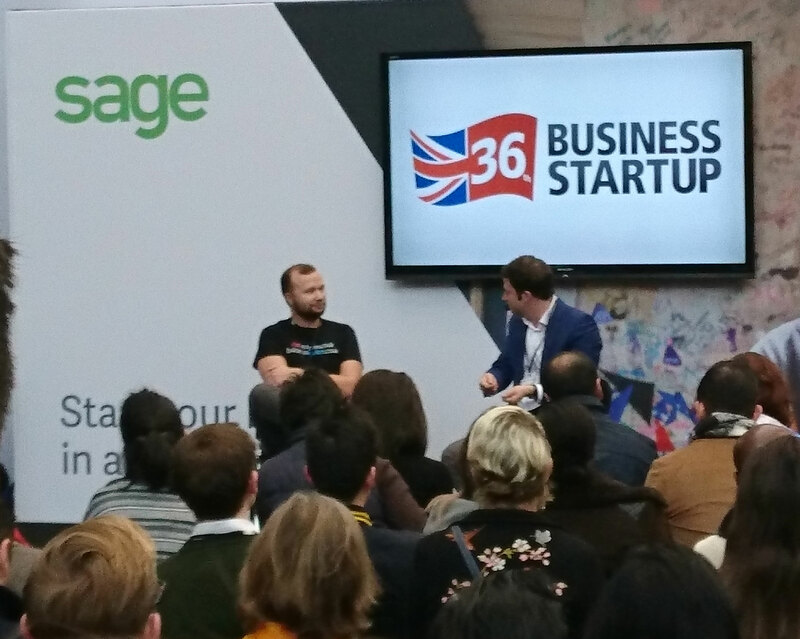 Sage’s core strategy for the event was their use of strategic partnerships with the Business Show team. Sage sponsored the event as well as one of the keynote theatre. Furthermore, members of the Sage management team delivered influential keynote speeches which helped to maintain Sage’s position in the industry as a thought leader. Later on in the event, to attract tired & lethargic event attendees, Sage set up a barista-style coffee bar which provided free coffee to all attendees in exchange for downloading the Sage app, which isn’t too dissimilar to the giveaway strategy employed by 9Spokes. The tactic of giving away a free coffee was, as expected, highly popular with the audience and was used effectively by Sage to drive app-installs & collect customer lead data. The promotion was seeded using social media with Sage reaching out to event attendees, invited them to visit the coffee bar to redeem their free drink. Sage’s presence at the event was hard to avoid, and overall, the methods of lead collection & event sponsorship employed appeared to work very effectively for a company at the size & scale of Sage UK. Nevertheless, it’s important to consider your budget when planning for an event such as the London Business Show 2016. 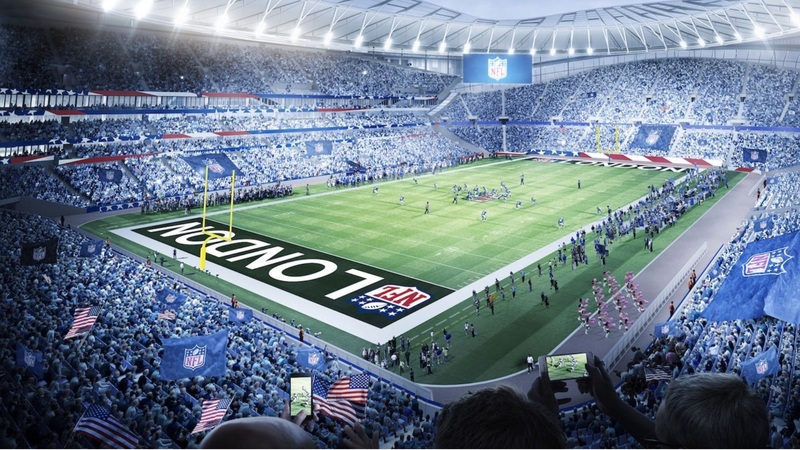 For businesses of a smaller size, sponsorship is not a realistic option and perhaps funds could be re-allocated to more guerrilla marketing efforts. 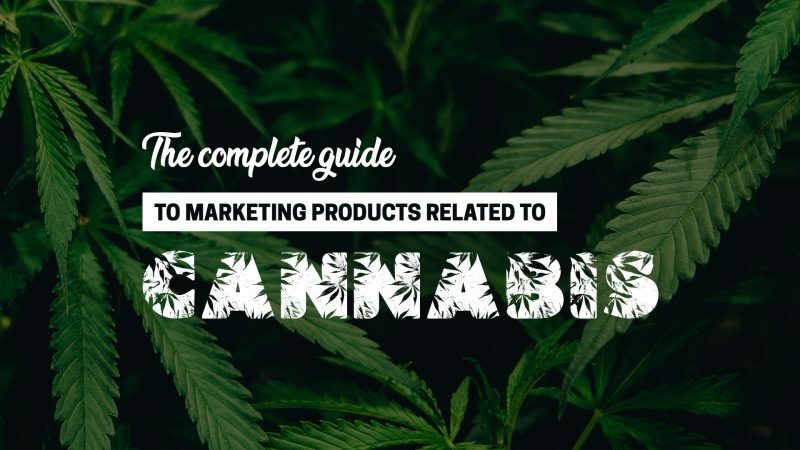 The 5 businesses mentioned in this post have all used different methods to gain customer attention & generate traffic to their stand at the event. Understandably, showcasing your business at any business show will always be a highly competitive experience. Yet, In many instances, otherwise interesting businesses do themselves a disservice by coming equipped with a relatively ordinary exhibition set up; a branded banner, some business cards & a couple of mints or sweets scattered loosely across a rented table. 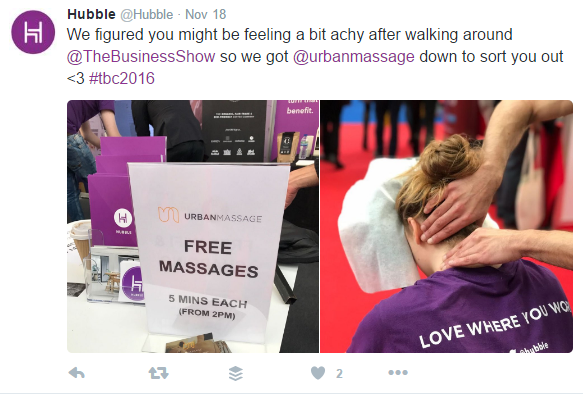 Did you attend the London Business Show 2016? If so share what you have learnt and let me know in the comments.